In what format shall I store the descriptions about video formats, sizes, and media types like segments, thumbnails, posters, transcripts, ect. ? What would be the right format in order to describe a course where students get there weekly portion of video content like in a MOOC? Structuring and sequencing could be achieved with SCORM, while system features and learning outcomes can not be expressed. How can we define collaborative learning activities for groups who are working on a instance of source video so that each group has its own playground for augmenting and discussing contents? What is a proper metadata schema for long time archiving of video footage from educational or research fields? Currently we know about videoMD, PBCore, and METS, but all those approaches for librarians not considering learning taxonomies, didactically methods, student interactions and other relevant descriptions. All these questions and many more could be ask in a joint standard initiative, but the way it is organized at IMS Global is questionable. While labeled as an ‘Open’ initiative the interested parties have to pay a yearly fee of $3,500 to get access to the working drafts and resources they have to pay $15.000 to become a voting member and influence the decision process. Even the discussion of the current members is not as transparent as one might expect. So fare Kaltura outed to be on of the participants (the only one?). All the others stay in the background and deciding about the future of educational video technology at our schools and universities. However, such an initiative could be literally open and invite a broad range of stakeholders form all around the world. Defining standards should be organized like the Request For Comment (RFC) papers or a W3C working group. The participants should communicate in public mailing lists or social network circles. Furthermore, all drafts should be made available by naming the contributing authors. Since a few days we are back home from the conference Films from Ghettos and Camps: Propaganda – Clandestine Messages – Historical Source that was held at the Terezin Memorial Estate in Czech Republic. Thanks to Natascha Drubek who organized the event we got the great opportunity to introduce our project “Thereseienstadt explained” to the international audience of historians, film scholars, and people from different archives. Last but not least we could met Karel Margry – the most proven expert of the film that we augmenting to a learning resource. For us it became clear that we will need some further financial support in order to assess the content quality of our productions as well as to translate the content for a broad audience. 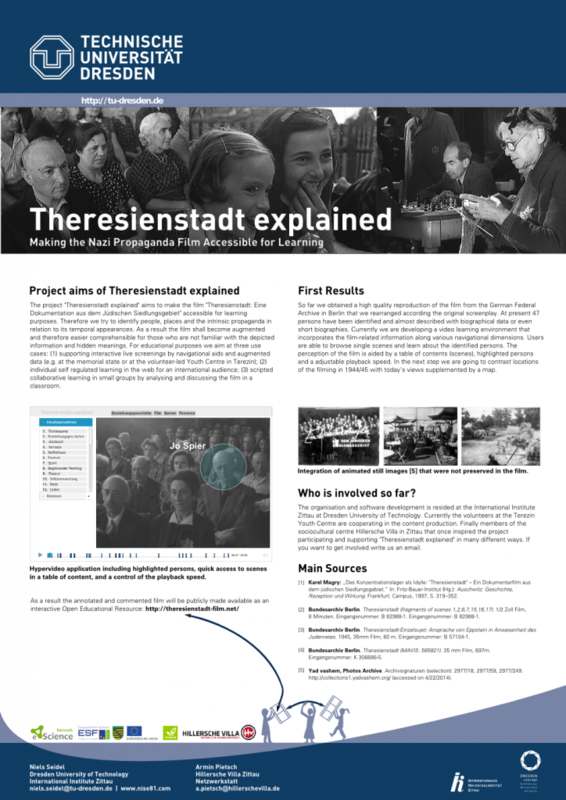 Therefore “Theresienstadt explained” will be resided as a regular research project at the International Institute in Zittau of Dresden University of Technology. The hand-out that we gave out at the conference. Mendeley is valuable tool to organize and annotate scientific literature. As power user you can get lost in paper space because Mendeley does not offer any tools keep track with all the collected metadata. Having more then 500 articles, book chapters and books in your collection makes it quiet difficult to overview relationships between authors/co-authors, publishers and keywords. Luckily Mendeley does not protect its local database on desktop computers. So its theoreticly possible to build an alternative to Mendeley but for the mentioned disadvantage its fare enough to collect some resonable data for meaningful visualisations. As a first example I will present some source code and visualization that gives you an overview about the quantity of authors and co-authors. Especially co-authors do not get that much attention while they play an important role, e.g. as senior scientist that tie generations of young researchers together. 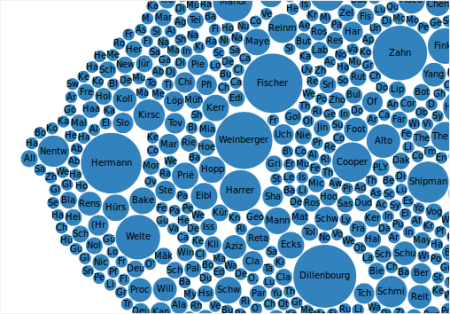 A snapshot of my Mendeley Database produced these bubbles representing authors of my collected publications. Surprisingly I discovered some new names that seem to play a bigger role in my research filed as expected. I have completed my slides for Wikimania 2011. This year conference is in Haifa/Israel, therefore I invested plenty of time to transfer my book into a real hypermedia Wiki. Hypermedia unites relted concepts of hypertext and hypervideo. But so far my contribution to Wikimania 2011 seems to be the onlyst concerning video and hypermedia at all. Martin Ebner revealed this nice video animation as wonderful example of time-related maps. By sliding through the centuries wars around the world pop up as explosions. Boundaries between video and animation are gone. The time slider is used to control the animation progress. Although time is the only interaction further dimensions are conceivable.